I have a special interest in drought-tolerant gardens. Our entire front yard (and minuscule side/backyard) is full of California native plants, all of them drought tolerant. One of the first things we did when we bought our current house was to have the lawn ripped out so we could do native plants. The garden’s gone through several iterations as I’ve learned more about California native plants, the various California ecosystems, and what works in our particular location, and as we’ve started working with a landscape gardener who works exclusively with California natives (I’d exhausted my knowledge base and wanted new ideas and a new perspective). Many of my knitting designs are named after California native plants! Having said all that, I was excited to get a chance to review The Water-Saving Garden by Pam Penick from 10 Speed Press. Anything that encourages people to conserve water and resources is worth at least a quick glance, and I think The Water Saving Garden deserves far more than that; it’s worth immersing yourself into. The Water Saving Garden is chock full of gorgeous, inspirational pictures, not just of the various plants but of other garden aspects: hardscape, water features, and more. It’s divided into five main sections: inspirational examples; emphasizing different ways to conserve water; planting; illusion of water; and a list of 101 water-saving plants with brief descriptions. Click here to see the full table of contents. The author acknowledges that not everyone will want a wild-looking native garden, and discusses other plants that can be used in a variety of garden types, with an eye for keeping in mind what the requirements, zoning, etc are of the plants you’re considering. This book has a very non-regional approach; as such, I think it’s very useful for inspiration. I think it’s very good for introducing the basics of water-saving gardening, and does a fabulous job of showing how those sorts of gardens can be beautiful, and the huge varieties of gardens that are possible. However, unless you’re considering working with a landscape designer familiar with water-saving plants specific to your area, do recognize you’ll need more regionally specific resources to design your own garden. The Water-Saving Garden does give you the groundwork (sorry, couldn’t help it) for evaluating what your next steps will be. Check out Pam’s site here. Workshop later this week! Emily progress. 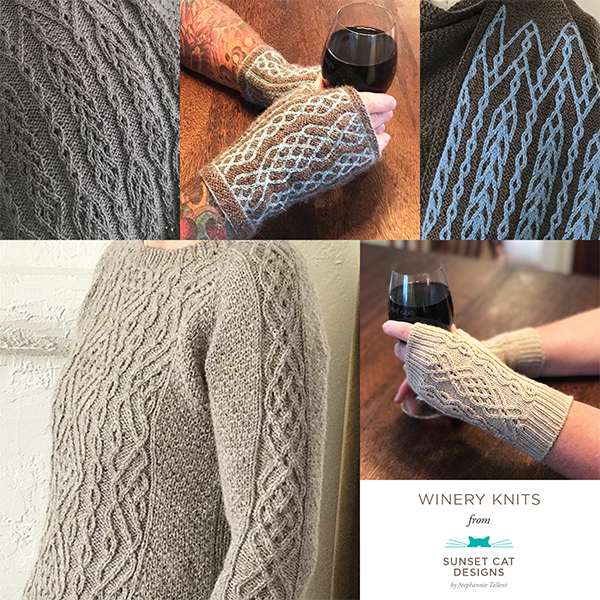 I’m getting excited about the Madrona mitten workshop. I leave Thursday morning, come back Monday evening. I’m in the midst of the lace & intarsia part of Emily. Luckily I was able to use the same size needle for both parts, unlike I originally feared; after initial swatching I thought I’d use a US4 for the Traveller and a US2.5 for the Gaia, but I’ve ended up using the US2.5 for both parts. The Traveller is knitting up well, giving a tight yet squooshy fabric. I think (hope) I’m still on track for finishing that section before the trip. Of course there’s no other knitting of which to speak. Garden-wise, we harvested another 20 or so tomatoes. I’ve not tried to do any preserving; we’re just eating them, usually in salad (mozzarella) or on sandwiches.